Iraq: The context is that we are human | spifftacular. A caution: Unlike most things on this blog, this post deals with some distressing subjects and descriptions. I do not mean to offend or sensationalize. If anything, the worst thing I could do is be trite. I want to share my thoughts and raw feelings and invite you to share yours. A foreign policy wonk, a war-games analyst, a global-change crusader: these things I am not. I am a homebody at heart. Most of my days are absorbed with my baby and any reading and writing I can squeeze in. I try to maintain at least a minimal awareness of our great big world, but I feel intimidated and overwhelmed trying to keep up with the constant, complex current of uprisings, strikes, disasters, and plights throughout the world. But no longer are my eyes glazing over as I skim through names of cities I will never be able to pronounce or pinpoint on a map (let alone visit). No longer am I reassuring myself that I shouldn’t bother trying to better understand the situation in such-and-such-place because I’m not familiar enough with its history and culture and it’s just too hard to understand the context. Now, I have realized the context I should have been starting with all along: I am human and they are human. The humans, and the humanness, of one particular story in the news has haunted me. It is the parched mouths of the thousands of refugees on Mount Sinjar in Iraq that morphed what otherwise would have been text on a page about a faraway tragedy–insurmountably foreign in both geography and personal experience–into a story, a reality, that has gripped my heart and dominated my thoughts and prayers. 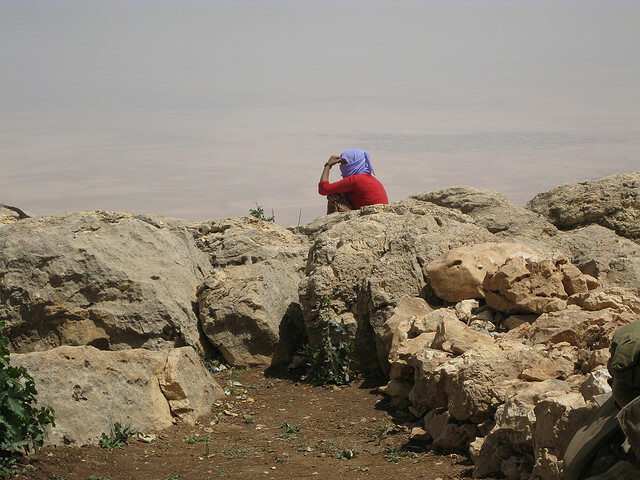 After fleeing with little but the clothes on their backs from ISIS’s campaign of extermination against religious minorities, thousands of refugees (mostly Yazidis, a religious minority group) are still stranded on the barren Mount Sinjar in the heat of summer. Iraqi, American, and British forces have airdropped supplies and flown out a small number of people, but those who remain are desperate and dying (or dead). And the other day I heard a story on NPR that mentioned a mother and her two-month-old baby who managed to get off the mountain; the mother’s milk ran dry, but she had found a mountain goat and suckled her baby on that. And there was also this report of parents tossing their children onto the helicopters bringing supplies. They would do anything to give them a chance to survive. I sorrow for each of these desperate fellow humans–parents, children, friends, people with their own hopes and dreams just like you or me–and stand in awe of those that somehow press on. I am in awe of those, now and throughout history, who cling to their humanity in the face of inhumanity. I struggle with the very idea of inhumanity–because we use the term to describe solely things that humans do. It’s an act of wishful thinking: We cannot wish away these inhuman things from happening, so we tell ourselves that those who do them are separate, that they are not us. But we do have those people in our world, and innocent people do suffer. Two novels I’ve read recently grasp at the horrors of genocide, deprivation, and cruelty–all parallels for what’s transpiring right now. Like Death, I marvel that our species encompasses both humanity and so-called inhumanity. It is only natural that we would take urgent action to respond to an urgent threat. Still, I am ashamed that it took something so extreme as an “imminent massacre” to awaken me to my mutual humanness with those under threat, and my obligation toward them. I told as much to my husband, and he reminded me that regardless of what I have or haven’t done or felt in the past, what matters is my impulse to do good now. Of course, that’s the tricky part. How to translate these raw emotions into tangible action, with so many borders between me and you and these fellow humans? A friend shared this article with some ideas, which I’ll paraphrase and elaborate on. 1. Get informed. You can’t take any meaningful action without knowledge. 3. Donate. You might consider donating to a charity operating in Iraq, such as Save the Children, International Rescue Committee, Mercy Corps, Action Against Hunger, Christian Aid’s Iraq Crisis Appeal, or Iraq Refugee Crisis on GoFundMe. If you have any other recommendations, please comment. 4. Contact your representatives. Perhaps you want to tweet President Obama and let him know you support the humanitarian airdrops. Perhaps you want to write your representative to let him or her know that you think the U.S. should offer more support to the Kurds (as explained in this article). Perhaps you think the government shouldn’t be involved at all. Whatever your view, share it with the people whose job it is to represent you. 6. Share. Pretty sure we all understand how social media works, right? 7. Stay informed. This will be the challenge for me, to remain committed to seeking the human context of even the most difficult stories. Since I have limited time and emotional energy, I will likely focus on simply reading the World pages of the New York Times more consistently. We all need to find our own balance. The ideal I strive for is to “bear one another’s burdens, that they may be light” and “mourn with those that mourn; yea, and comfort those that stand in need of comfort” (Mosiah 18:8-9). That ideal is taught by Jesus Christ, but is common across religions: it is human. Do you have suggestions for how to help? How do you make sense of the dizzying mess of things happening around the world? How do you find human connections across borders and make them meaningful? Follow reporter Jonathan Rugman’s Twitter feed for pictures and videos of the continuing situation. The New York Times has (of course) provided thorough reporting that is still accessible for just-entering-the-story readers. I particularly found its collection of maps and graphics and this article about recent regional politics helpful. I also learned from the CNN article mentioned above, this New Yorker essay about one refugee’s story, and this Slate article about why the U.S. is intervening. It was in this New York Times article, following a description of the first airstrikes against ISIS near Mount Sinjar. I presume the authors chose to call attention to the safety of the aircraft to abate the fears of Americans wary of yet another conflict in Iraq. In the chaos of war, it is a relief to see the good news that is so often the exception. Although reporting should never be sugarcoated, it is refreshing to hear about bad things that could have but didn’t happen. That is truly a gift.